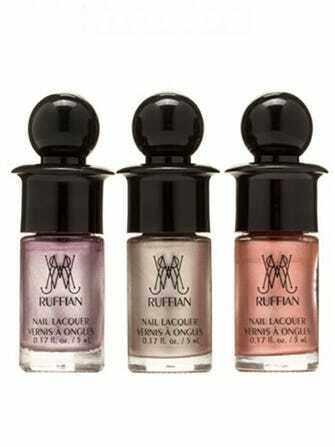 It may be a quintessential New York label, but Ruffian's latest release has L.A. written all over it. Yesterday, the brand launched its latest polish collection, which — in addition to the fact that it celebrated this in Los Angeles — feels like it should be paired with a chic white bathing suit, a caftan by The Row, and worn poolside at the Beverly Hills Hotel. Dubbed The Rapture Collection, the lacquer trio consists of three not-your-average metallics — Rosary, a rose gold; Ambrosia, the perfect marriage of lavender and silver; and Relic, best described as a slightly golden neutral. Sold exclusively at Birchbox, the polishes can be purchased as a collection or individually. That said, buying all three would be a wise decision — they're everything your nails need to get through this summer in style. And, to the Ruffian boys, you're totally welcome to convert permanently to the West Coast lifestyle.